Photo of Mitchell Jarvis by Christopher Mueller. Is capitalism and corruption as pervasive today as when Bertolt Brecht and Kurt Weill wrote The Threepenny Opera in 1920’s Germany? They certainly thought so then basing their theme on John Gay’s 1728 The Beggar’s Opera. In Signature Theatre’s use of Playwright Robert David MacDonald’s and Lyricist Jeremy Sams’ 1994 modernization of the original musical, they certainly believe it still to be true. Citing a Pew Research Center report that income inequality is at its highest level since 1928, Signature’s Artistic Director Eric Schaeffer shows the theme is timeless. Does the slogan “We are the 99%” sound familiar? Set in a dystopian future the current Prince William is about to be crowned King William V (Theatregoers are treated to a flower-strewn memorial to the current Queen surrounded by the lurid headlines of her death on tabloid front pages.). Director Matthew Gardiner has created and choreographed a cacophony of street-world chaos – – a place where Misha Kachman’s evocative set design features a neon sign for “Instant Cash” and graffiti covering the walls of dirty alleyways, and Sound Designer Lane Elms evokes the blaring noise of the city. It’s a gritty world where hookers, strippers, conmen, and beggars are positioned at stage level while slick-suited financiers stroll an elevated catwalk, looking down on the hoi polloi beneath an electronic ticker-scroll with the stock prices of the day. The dichotomy between the haves and have-nots is as clear as the bell announcing the start of business on the floor of the London Stock Exchange. 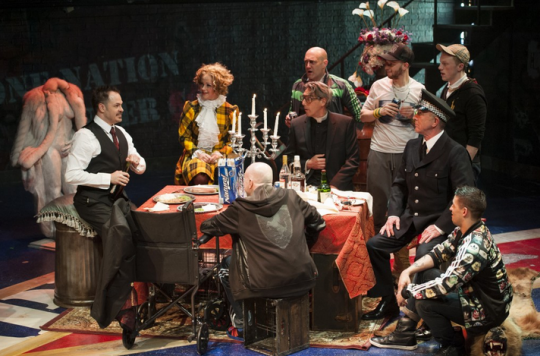 Macheath (Mitchell Jarvis, left) holds court on his wedding day (from left clockwise: Erin Driscoll, Sean Fri, Thomas Adrian Simpson, Paul Scanlan, John Leslie Wolfe, Ryan Sellers, and Rick Hammerly). – Photo by Margot Schulman. Natascia Diaz plays the prostitute Jenny, with an ennui that chills to the bone. Opening with the solo “The Flick Knife” a mournful song that describes Mack as the low-down murderer she loves, she offers up an eerie and halting rendition of the grisly ballad. Jenny (Natascia Diaz) sings “The Flick Knife Song” – Photo by Margot Schulman. As shakedown artist Mr. Peachum (Bobby Smith) describes “the five basic varieties of human wretchedness” in “Morning Chorale”, “the beggar, the banker, the cop – – they’re all of ‘em out on the take”, he hands out crutches, fake limbs and tattered clothing to his beggar candidates. Mrs. Peachum (Donna Migliaccio) his cohort in crime aids in dostressing the garments with a scissors while their daughter sweet Polly (Erin Driscoll) takes it all in. 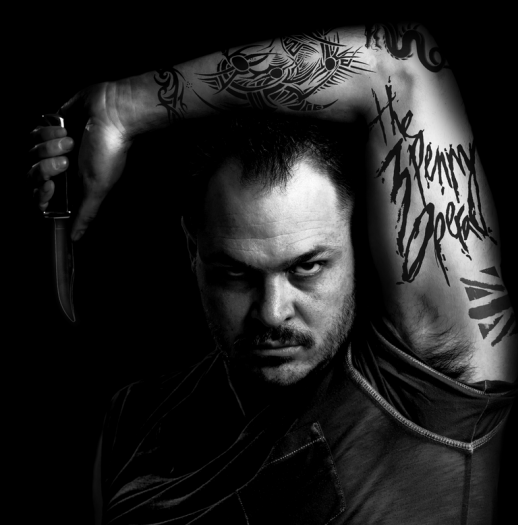 But is anyone more evil than the Machiavellian Macheath (Mitchell Jarvis) who, as quick as he slits a throat with his shiny shiv, marries the headstrong Polly alongside his band of thieves? Costume Designer Frank Labovitz has created an arresting display of colors, patterns and styles to depict the criminal lifestyle. Using what is known as the “chav” style of clothing adopted by a British anti-social youth subculture, Mack’s gang of thieves sport a mashup of designer clothing wearing pimp bling, Burberry caps and the latest in cell phones. The hookers led by Jenny rock 6-inch stilettos, 12-inch high hairdos and fabulously racy lingerie, while Polly is a vision in a yellow Scottish plaid suit and beribboned hose. Polly Peachum (Erin Driscoll) and Macheath (Mitchell Jarvis) sing “Love Duet”- Photo by Margot Schulman. The production uses a variety of technology to suggest the insidiousness of our technology overload. Lighting Designer Colin K. Bills and Video Designer Rocco DiSanti effect quick mood changes by infusing scenes with Brechtian philosophy by flashing platitudes across an electronic board above the fray. Phrases like, “Depart from evil and do good,” and “Seek peace, and pursue it,” Brecht’s exhortation to his characters to beware of dehumanization through immorality. DiSanti’s atmospheric lighting succeeds in heightening the tension and the chilling ferocity of the scenes. There are too many eye-popping scenes and phenomenal singing to describe here but watch for Rick Hammerly as Lucy Brown who shows up to challenge Polly for Mack’s affections and nearly brings the house down with his drag performance as the pregnant Brown, “He’s Mars and I’m Venus,” she (he) explains; Jarvis’s descent into madness in “The Ballad in Which Macheath Begs All Men’s Forgiveness”; and Diaz and Jarvis’s steamy, macabre duet in “A Pimp’s Tango”. Jenny (Natascia Diaz) and Macheath (Mitchell Jarvis) dance in “A Pimp’s Tango.” – Photo by Margot Schulman. Jarvis gives us a psychopathic yet charismatic Macheath – – the personification of evil and raw sexuality in a character as powerful, riveting and cringe-worthy as the Devil himself. For Jarvis who effortlessly alternates between charm and depravity, it is a soul-searing triumph. Impeccable casting and masterful direction by Gardiner inform this brilliant production. Through June 1st at Signature Theatre (Shirlington Village), 4200 Campbell Avenue, Arlington, VA 22206. For tickets and information call 703 820-9771 or visit www.signature-theatre.org.